From the introduction screen, select the "Protect Files" option to start selecting the files and options for protecting your files. 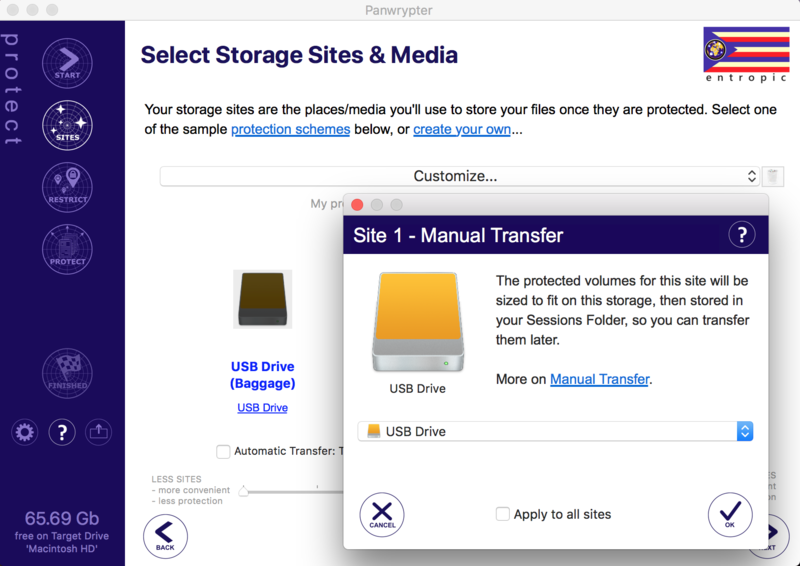 The Sites screen is where you define your storage sites - how Panwrypter will protect your files & folders. Using the popup menu, you can select from a list of existing built-in protection schemes, which demonstrate how to protect your files, based on a number of scenarios, such as safekeeping, group safekeeping, and travel. Additionally, you can customize and save your own protection scheme, by using the number of sites slider to indicate how many sites to use, along with selecting each of the site icons to provide site-specific preferences. Panwrypter will automatically go into "Customize" mode, should you modify any of the site preferences. You will later be asked to save this protection scheme, so you can use it in the future. Selecting the popup menu will allow you to select from a list of pre-defined Protection Schemes - a convenient way to select how to protect your files based on your familiar storage habits. Once you have selected a protection scheme, the sites and number of sites illustrated below will change to reflect your choice. Panwrypter will automatically go into "Customize" mode, should you choose to modify any of the preferences in the currently selected protection scheme. If you customize any protection scheme preferences, you will later be asked to save this protection scheme, so you can use it in the future. Adjust the slider at the bottom of the screen to increase or decrease the number of sites you want to use. Selecting the field below each of the storage site icons will allow you to specify a clue for each site. The clue helps you to remember the details of your storage site at a later time, in the event that you cannot remember. Providing clues below each storage site means that Panwrypter will automatically create a Clue Card that you can print and store offline, following protection. Enabling the "Automatic Transfer" checkbox means that your protected volumes will be automatically transferred to each storage site following protection. Provide the location of each site by selecting each site icon, and specifying the site location. Select the "Apply to all sites" checkbox to apply the same storage location to the remaining sites. Note: The "Apply to all sites" option is provided for convenience in specific situations only. Generally speaking, using this option is not advised as it undermines the purpose of Panwrypter's style of protection. Disabling the "Automatic Transfer" checkbox means that your protected volumes will be left in your Temporary Sessions Folder on your Mac, for you to manually transfer to your storage sites at a later time. You may optionally specify the type of storage media you want to use at each storage site. Doing this will tell Panwrypter to automatically size your protected volumes, which makes it easier to transfer to your storage sites/media if you have a large amount of files. Select the "Apply to all sites" checkbox to apply the same storage media to the remaining sites. If you want to limit/restrict your protected files from being restored to specific physical locations, enable the checkbox on this screen. You can now navigate the map to indicate one or more physical locations. Double click on a specific location, or select the (+) button to add it as a restricted restore location. Adding one or more location(s) on this map, means that your protected files can only be restored from these location(s) only. Any attempts to restore your protected files from other locations will be denied. To remove a restricted restore location, simply click on the specific location pin until it's location caption is displayed, then select the (-) button to remove it. To remove all restricted restore locations, simply select the (x) button. Under "Session Name", provide a name for this group of protected files. This name will be used to create the protected volumes and their related folders. It helps you identify them when you need to access the protected files in the future. Under "Files and Folders", use the add (+) or remove (-) buttons to add/remove the files and folders you want to to protect. Use the clear (x) button if you want to clear the list. Note: When the files are protected, the resultant protected volumes will be stored in the "Sessions Folder" that you can configure under Preferences. Provide a password that will be used to protect the storage volumes at each of the sites you specified. Note: Though the protected storage volumes at each site cannot be reverse engineered due to the depleted nature of the data, the password provides an additional barrier to preventing these volumes from being accessed at any given site. Select "Ok" to start protecting your files. The protection process will start. The files you selected will be depleted and packaged into protected storage volumes based on the individual sites and preferences you configured. 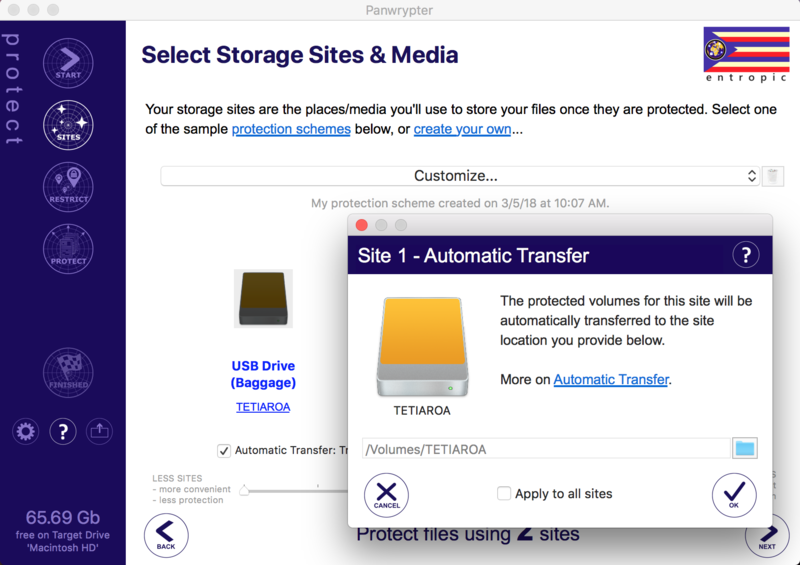 If you selected the "Automatic Transfer" option, the "Transfer Screen" will be displayed, and the protected volumes for each of your storage sites will be transferred to their respective storage locations that you provided on the Sites screen. Each site icon on this screen has a progress indicator, showing how much of each storage site has been transferred. If there are any important messages related to the file protection, a red exclamation button will appear. Select this button to display a list of the issues that occurred during the protection process. If no issues occurred during the protection, you are now finished. If you unchecked "Automatic Transfer" on the Sites tab your next step is to transfer the protected volumes from each site to your designated storage media/sites. If this is your first time protecting files, it is a good idea to perform a practice restore of your protected files. This will help you become more familiar with the concepts of using Panwrypter.